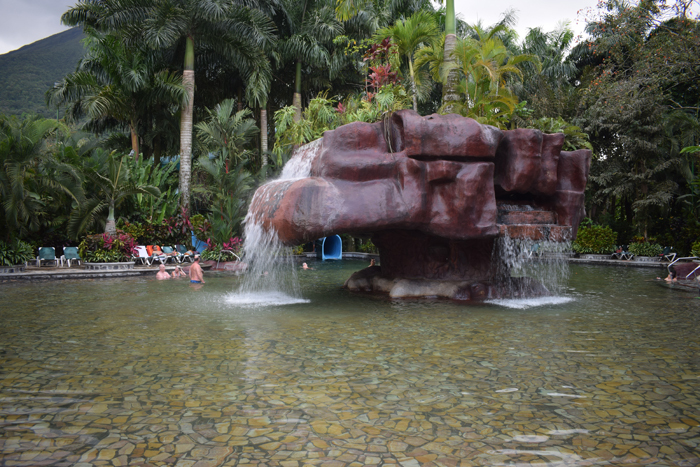 LA FORTUNA, Alajuela — We got wet in our private hot tub. We ate three-course meals ending in cheesecake. We soaked in magma-heated springs until even our dry parts were sweating. And we loved it. 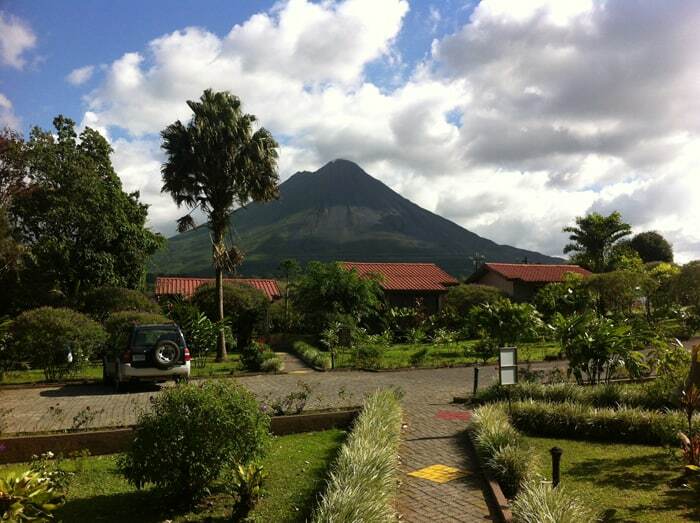 Arenal is a paradise for anyone who likes to stay in hotels, and staying in hotels is one of my favorite things to do. I have standards, mind you — location, view, design, architecture, art, beauty, food, bar, pool, gardens, bedrooms, bathrooms, and I could go on. But in Arenal I was spoiled by an embarrassment of riches. It wasn’t easy to trim the list of great hotels in this place to 10. But here goes. 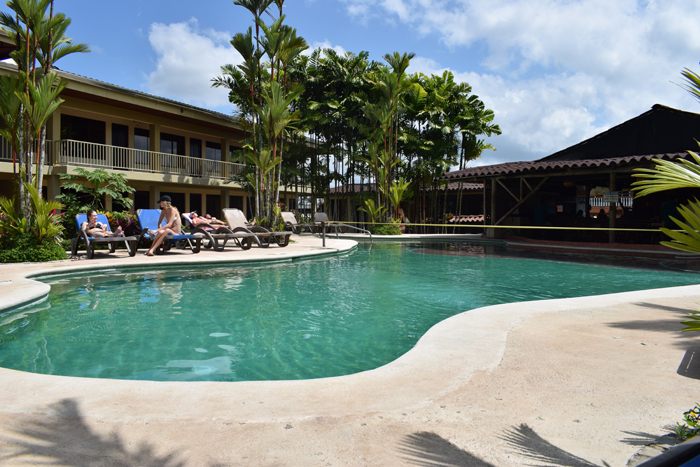 I would not call these “the best,” just 10 hotels in Arenal that we really liked, in a range of prices, in alphabetical order. This place calls itself a “five-star hostel,” and though the stars are self-awarded, they are well-deserved. It’s the best hostel I’ve ever stayed in, and I’ve stayed in plenty. I would call this a ho(s)tel, meaning it’s both a very affordable hostel with shared dorms and a nice hotel with great private rooms. I like hostels for the price and the opportunity to interact with fellow travelers who are typically young, fun and talkative; I like hotels for the privacy and the security of having a room to lock up my stuff. This is the best of both worlds. 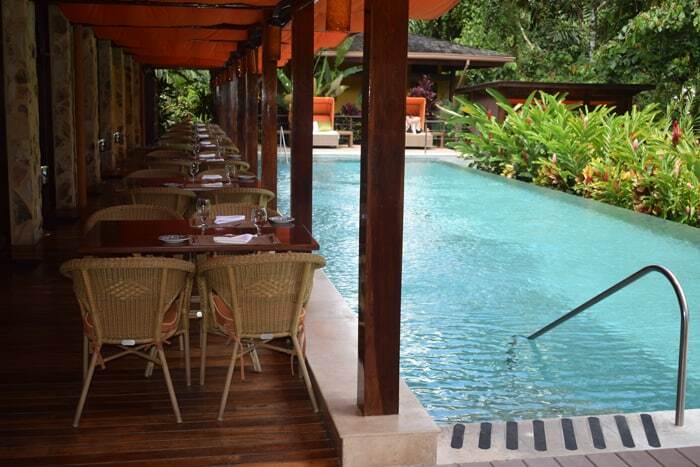 You can start with the swimming pool, which is never deserted except when raining or late at night. It has a tightrope across the middle where people try their luck at crossing, rarely making more than three steps. (You can win two free drinks from the manager if you make it across, though having tried it, I think this should be worth more like $100.) The tightrope also serves as a water volleyball net, with games sometimes lasting until the night watchman blows the whistle. 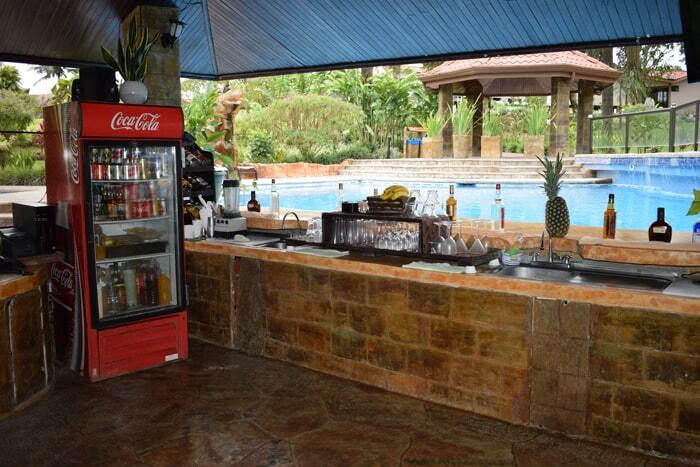 Next to the pool is a large rancho where the reception is located and where meals and drinks are served. It doubles as a shaded place to lounge on a couch, pet a cat or plug in your phone. The six shared dorms, for six, eight or 12 people, are male/female or female only. I was frequently amused by the number of people who entered or exited the dorms by climbing through the large, low windows because someone else had the key. 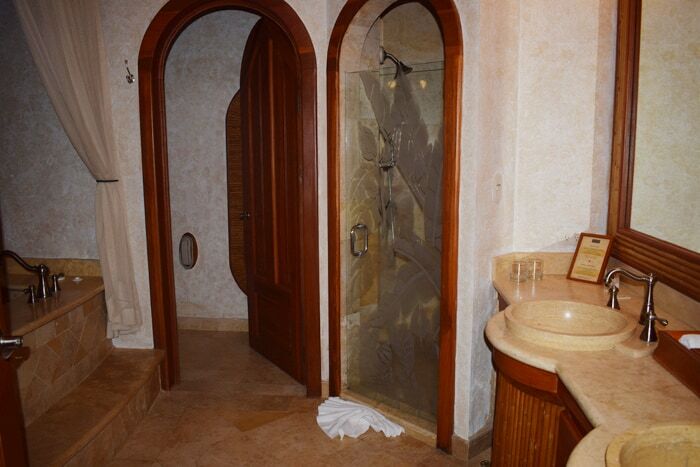 There are 21 private rooms with private baths and three with shared baños. All have A/C and hot water, and almost all have TVs. 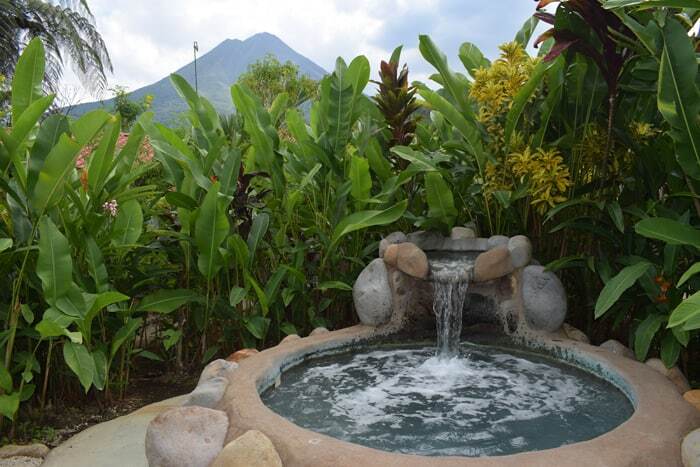 We stayed in two rooms with private baths, one with a balcony and a volcano view, and we liked them both very much. Rates are somewhat variable but are roughly $15 for a dorm, $45 to $55 for a private room with a shared bath and $50 to $80 for a private room and bath. For true budgeteers, there are also 10 tents on platforms, with more under construction. 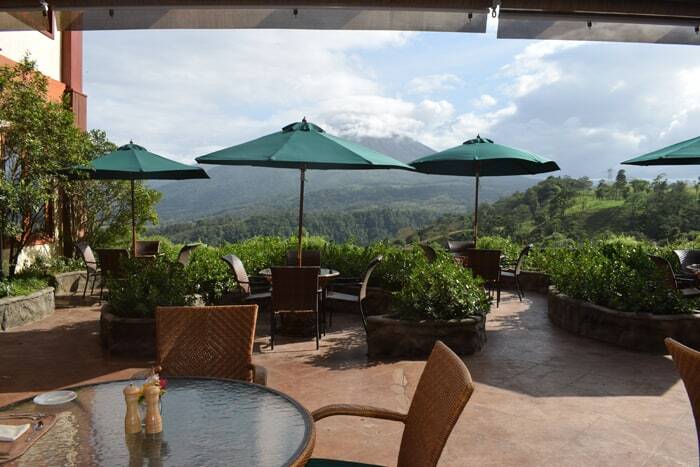 Kioro has some of the best views in all of Arenal, not just of the volcano, but of the panorama of gardens and hills that surround it on all sides. And the rooms are the bomb — huge, beautifully decorated suites with a big hot tub in the corner, with cross-ventilation from not one but two balconies, on both sides. The yellow, red and wooden walls are complemented by museum-quality artwork, including pieces by the celebrated Costa Rican artist Isidro Con Wong. One painting of a flower on our wall was almost as tall as I am. Of course there’s A/C, a minibar, a safe box, an iron, a separate shower and toilet, and lots of nice furnishings — two queen beds or one king, a day bed, an armoire, a desk and a table, with upholstered wicker chairs and benches. 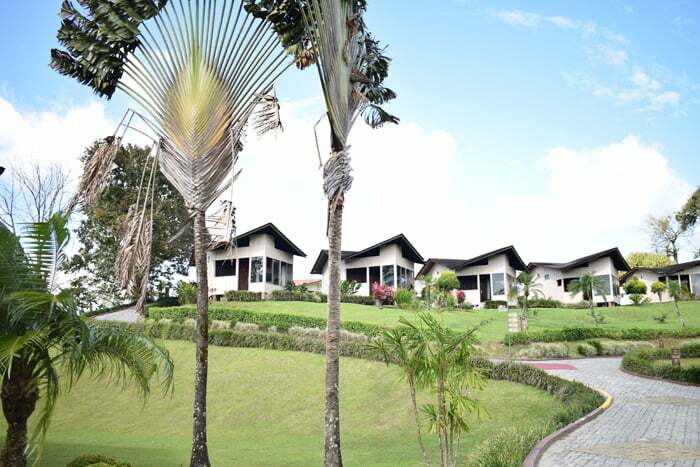 Decorated in the style of an old Costa Rican hacienda, Kioro has the maximum five stars from the Costa Rican Tourism Board (ICT) and the maximum five leaves from the Certification for Sustainable Tourism (CST). There are two restaurants, an adult pool, a kids’ pool and seven small, cozy hot springs, using water pumped from several kilometers away. The expansive gardens are lush and immaculate — real standouts in an area where beautiful gardens are common. Here we enjoyed one of the very best meals here we’ve had in this area. The cream of tomato soup was the best I’ve ever tasted, and the chicken breasts in mushroom bechamel sauce and penne with grilled chicken, sauteed mushrooms, onions with Dijon and pesto were divine. The 53 suites here are all identical (except some have one king bed and some have two queens). Depending on the season, they go for $288 to $324 double, breakfast included, plus taxes. We found this place very hard to leave. We wandered up and down this hillside resort, checking out the hot pools, waterslides, kids’ area, helipad, sports bar and more, and we toured its finest suites and stayed in one of its humbler cabañas. Many of the rooms are truly posh, with private terraces, hot tubs, 50-inch plasma TVs, elegant furnishings and striking artwork. There’s lots of bamboo, almond and cedar, all of it Costa Rican, and the overall effect is aesthetically pleasing, if a bit “Las Vegas,” i.e., big and splashy. I climbed a bunch of stairs to try the biggest, fastest waterslide, which looped around wildly in an enclosed tube where I was blind and water-choked for a few terrifying seconds. Then I was dumped at great velocity into a warm pool, where my left leg went north and my right leg went south, and I surfaced gaping at my girlfriend, who laughed as I attempted to regain the power to walk. We each had an Imperial at the warm swim-up sports bar, but at $5.50 each, these beers could drive a man to sobriety. Baldi struck us as a fun place to splurge, though not one for penny-pinchers seeking therapeutic relaxation surrounded by nature. Rates for the three main types of rooms here range from $244 to $364 double, taxes and breakfast included. This is a newly remodeled hotel just beside the church on the main street in downtown La Fortuna, so even if it isn’t brand-new, it feels like it. Gone are the gigantic old air-conditioners and the boulder-sized televisions, replaced by sleek new A/C units and 40-inch flatscreen TVs. 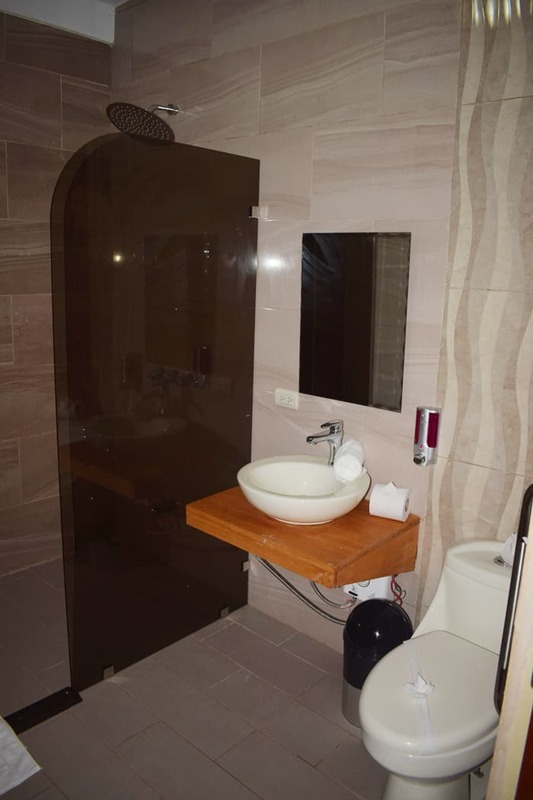 Bathrooms have been beautifully remodeled, with attractive tile walls, rain showers and new toilets and sinks. The mattresses are also new, as are the big wooden headboards, and if the walls are still a bit bare, stayed tuned for artwork that will be added soon. The 24-unit, three-story Downtown Inn has a pretty, heated swimming pool with a waterfall feature. 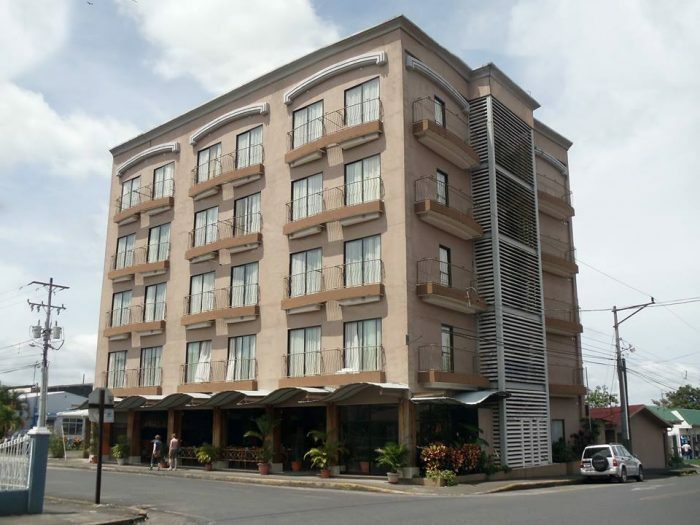 The hotel is a good choice for those lacking a car, as you can walk from here to anywhere in Fortuna, though there is a private parking lot 150 meters away. Rates are $80 to $100 double, taxes and breakfast included, and pets are welcome. 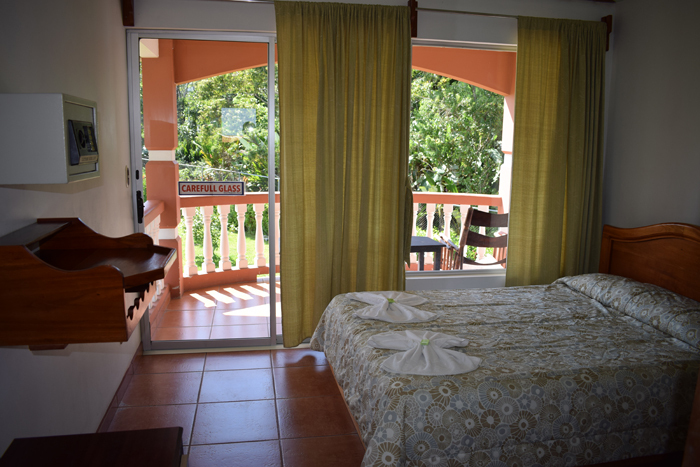 All rooms have A/C, TV, hot water and free Wi-Fi. In a destination defined by luxury resorts and lavish hot springs, sometimes all you need is a no-frills, budget hotel. That’s where Hotel La Fortuna comes in. 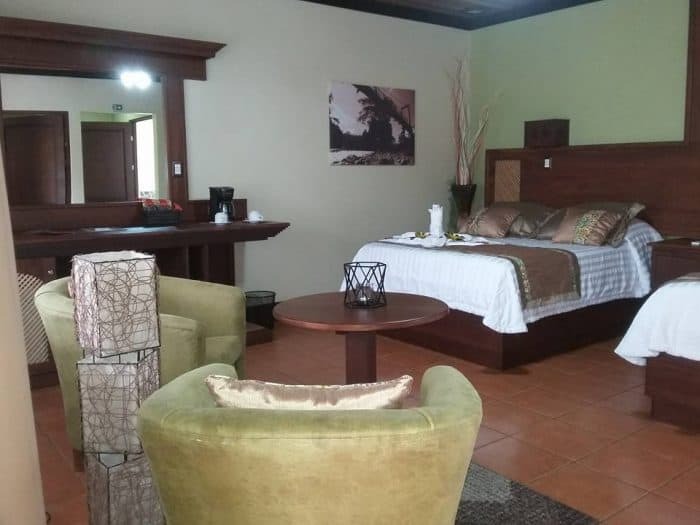 What started as a few cabinas nearly a decade ago has become a staple of comfortable and affordable lodging in the center of La Fortuna. This five-story hotel is one of the tallest buildings in town, boasting west-facing rooms with amazing views of the volcano. 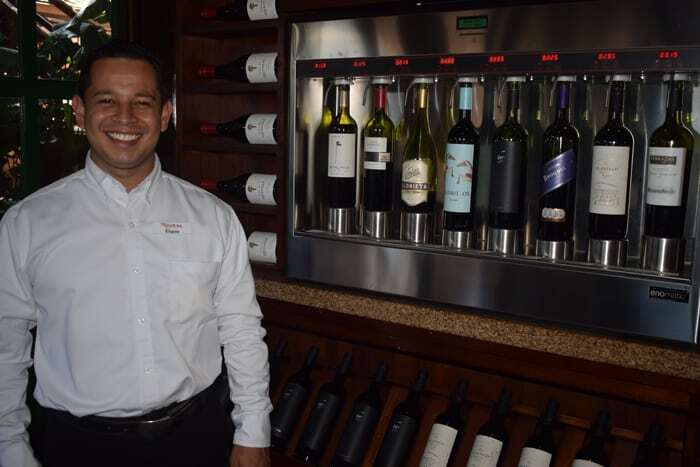 Manager Victor Prudente, who has worked at the hotel for a year and a half, said the hotel’s big pluses are its central location and its tour booking services for guests seeking thrills near the volcano or the lake. Depending on the season, standard rooms with a view cost as little as $70 per night, whereas rooms without a view go as low as $60 in the rainy season. The extra few dollars spent on a room with a view is well worth it. 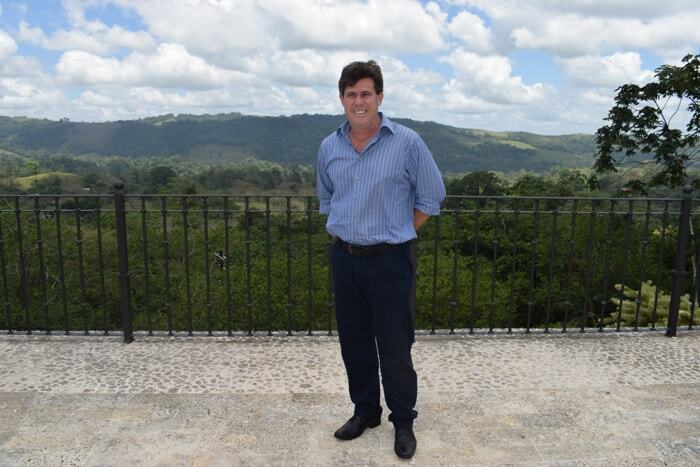 “On clear days, the view from those rooms is phenomenal,” Prudente said. 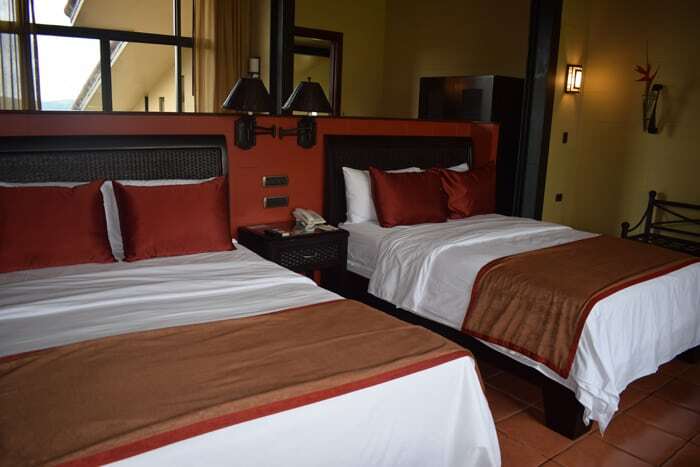 Hotel La Fortuna also offers guests a small gym and free breakfast every morning from 7 a.m. to 9 a.m. 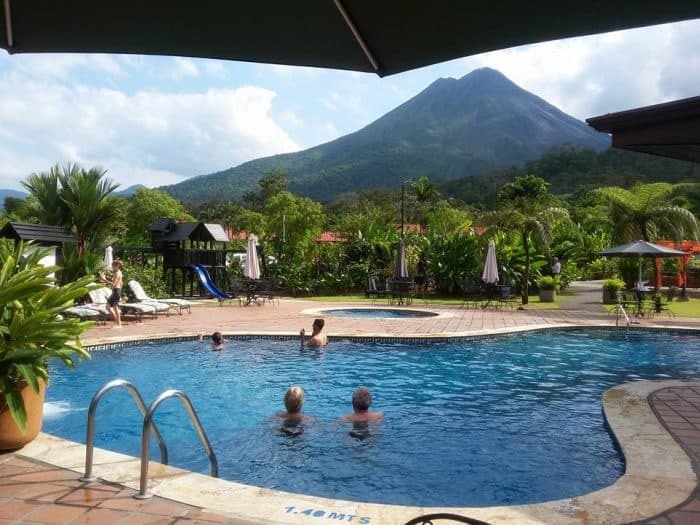 Though it doesn’t have a pool and has often spotty Wi-Fi, like many small hotels here, it remains a dependable and solid budget option for your stay in La Fortuna. If I had to build a 70-room hotel, my first thought would be to make it seven stories tall and put 10 rooms on each floor. The people at Montaña de Fuego decided to build 58 separate bungalows, plus two other buildings with more rooms than one. The result is a sprawling array of pretty little casitas on a green hillside, each of them shaped in front like an arrowhead, as if designed by an architect with a fear of 90-degree angles. “They’re in the shape of a point,” said manager Luis Villegas, a co-owner along with his father and sister. “The idea is that when you’re in a room there’s nothing to obstruct your view of the volcano.” He described the concept as rustic, wooden, bungalow-style, stand-alone buildings that create a sense of privacy, so you feel surrounded by nature rather than neighbors. 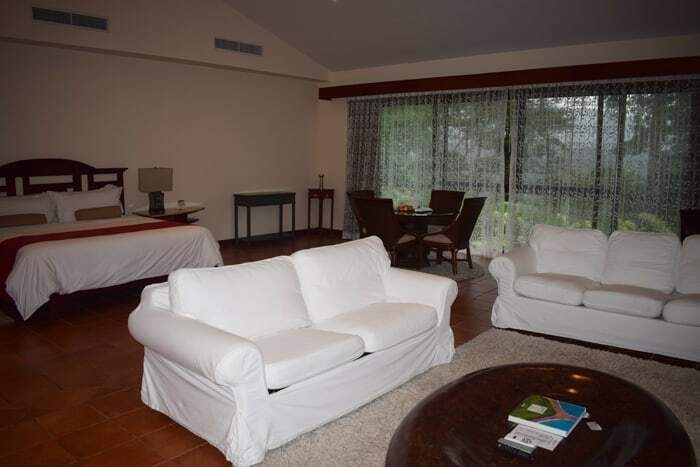 The rooms are splendid, all with A/C, TV and minibar, and the view of the volcano never gets old. Our room had really pretty pine walls and ceilings that actually smelled like fresh wood, and there was also an in-room Jacuzzi. Near the center of the complex there’s a nice pool and pool bar, and there’s a spa that offers massages and treatments done with volcanic clay quarried on the property. There are 4 kilometers of trails here and a free guided hike at 6 a.m. every day to see birds, sloths and monkeys. At 11 a.m. fresh clay is brought from the quarry, and guests are invited to take a mud bath. 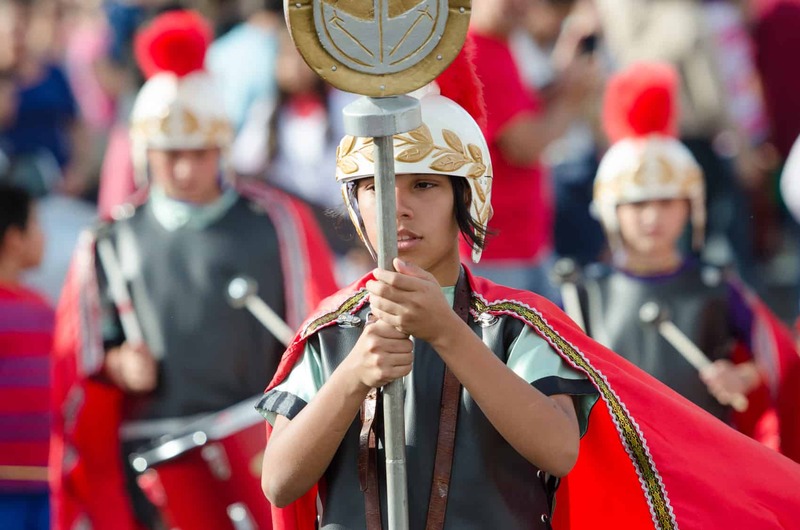 The hotel also partners with a half-dozen families from the Maleku indigenous group to offer tourists an introduction to their culture and to sell their arts and crafts. 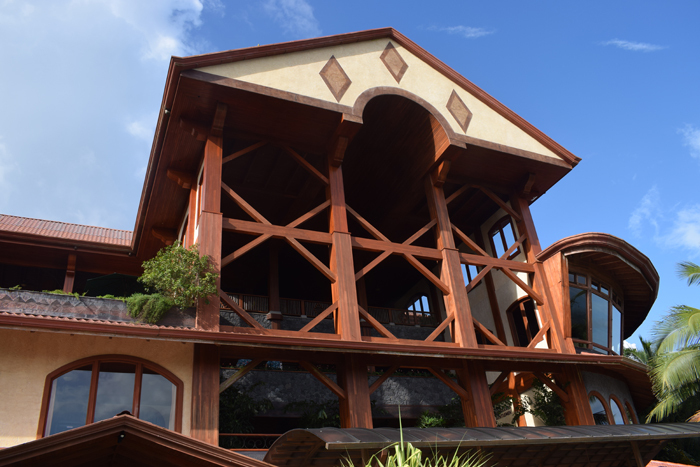 The hotel’s sister company, Go Adventure Park, offers ziplining, rappelling, horseback riding, tubing, nature hikes and birdwatching. We rode horses to the Arenal River with a friendly, funny cowboy named Alex, who cracked us up by repeatedly charging at some mules to drive them away, waving a branch and shouting to raise the dead. Room prices are between $131 and $231 double, with taxes and breakfast included. The hotel also offers an all-inclusive option, with prices starting at $115 per person. 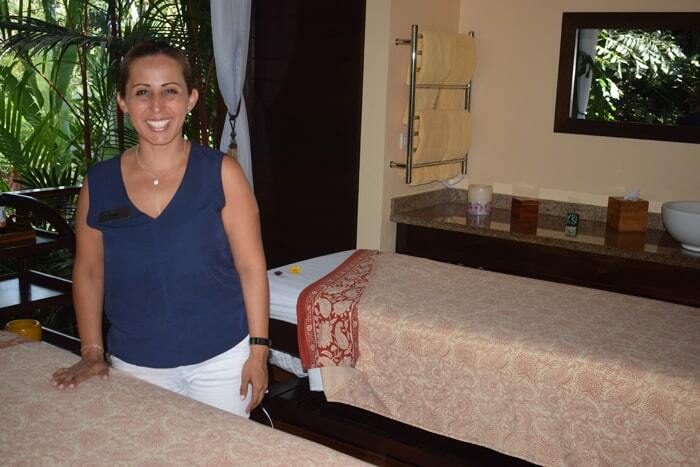 In 2015, Trip Advisor named Nayara Springs the No. 2 hotel in the world. It’s also been named the No. 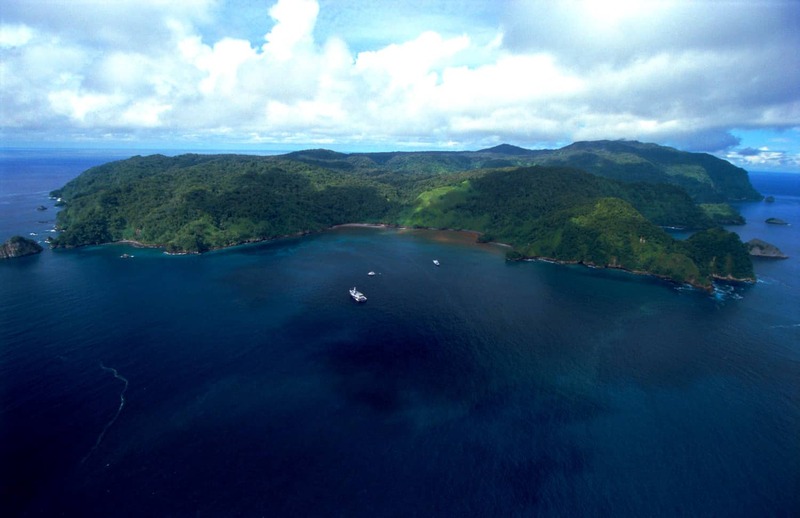 1 resort in Central and South America by both Travel + Leisure and Conde Nast Traveler. There are two hotels here: the 9-year-old Nayara Hotel, Spa and Gardens (“Nayara” for short) and the more exclusive, 3-year-old, adults-only Nayara Springs. You can drop $850 a night at the latter, or you can slum it at Nayara for just $400, plus tax. Breakfast is included, so to get your money’s worth, be sure to eat a big breakfast. 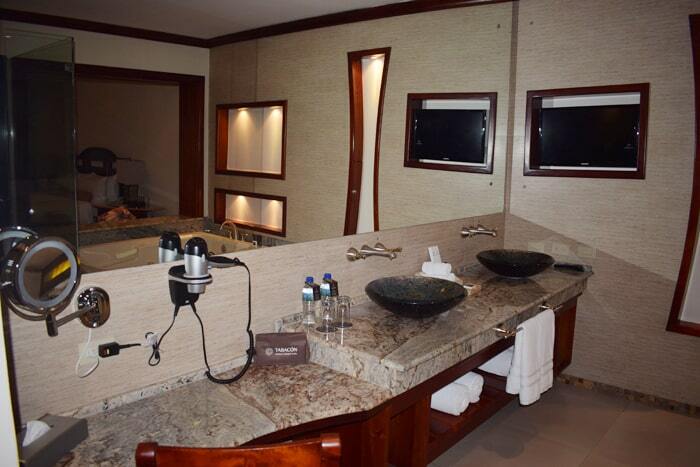 The bathrooms, with outdoor showers and his and hers sinks, are bigger than many hotel rooms. 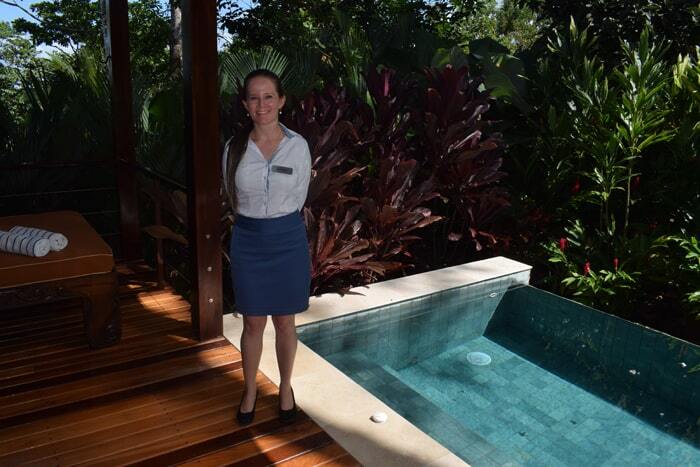 And if you like minibars, go wild — it’s included at Nayara Springs, although not at Nayara. International calls are also free, so be sure to call all your friends back home just to make them jealous. Yoga is offered every day in a beautiful new shala, and there are cooking classes, nature trails and por supuesto nice swimming pools. There’s a world-class spa and five restaurants, including a wine bar with a “vending machine” where you can select a taste, a half-glass or a full glass (at $7.50 to $20) of various wines from all over the world. I asked the sommelier how he learned about wine and he said primarily by drinking it. Checking into this 5-star resort, we felt a bit like the Beverly Hillbillies, trying not to gape at something completely beyond our experience. Our suite was 1,076 square feet — twice the size of a basketball court. The ceiling looked about 20 feet high. There was a couch and a love seat. There was a king-size bed, a big TV, a bar, a desk, a round glass dining table with four chairs, two end tables and a couple of wide tables that you put against a wall when there’s too much wall space. Many of these were topped with what looks like granite (but might be gneiss). The bathroom was like a multi-room suite of its own. There was a room with a toilet and a bidet and a telephone, for serious multitaskers. There was a closet with three doors, and a light that turned on as soon as you opened it. There was a rain shower with glass doors and what looked like green granite walls. There was a big Jacuzzi with 10 jets. There were elegant his and hers sinks. There was a television in the bathroom (seriously). And there was a seating area for putting on makeup that doubled as a perfect desk during the writing of this paragraph. It would be superfluous to say that all of the 103 rooms here have hot water, but I was surprised to learn that all the water that comes out of the taps here is thermal, heated not by electricity but by Mother Earth. Costa Rican architect Jaime Mikowski discovered this property in 1991 while searching for water for a water bottling project. In a region rich in hot springs, Tabacón is unique because of five nacientes — springs that arise naturally from the earth and are not drilled and pumped like the others. And when I say “springs,” don’t think of still ponds but rushing, hot rivers fed by abundant rainfall, heated by magma and powered by gravity from steep hillsides. 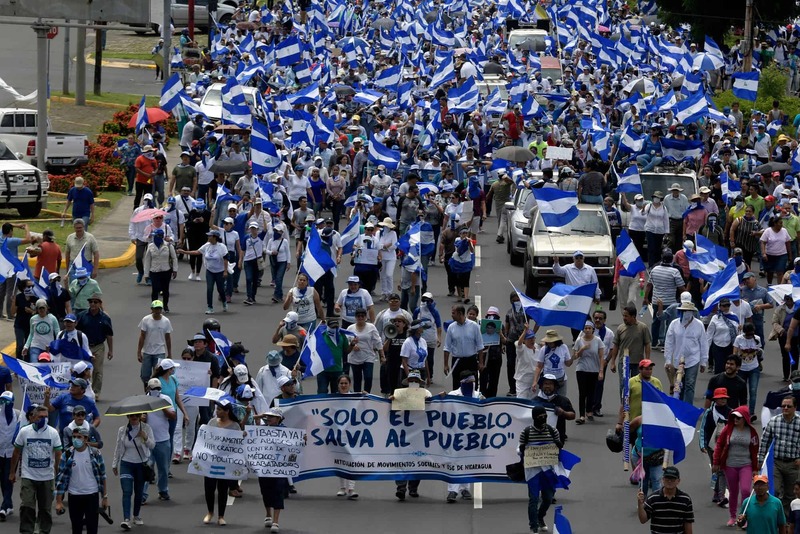 These five springs join to form the large, swift and hot Río Tabacón. 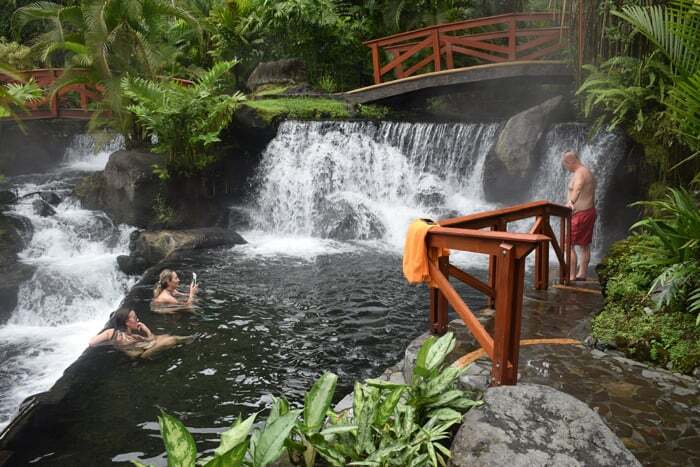 Tabacón enjoys a pride of place that no other resort here has, and its complex of 20-plus termales, waterfalls, cold pools, elegant gardens and labyrinthine paths are second to none. Even if you can’t afford a room here, it’s worth spending $70 to $85 for a day pass (half or full) with lunch or dinner included, to wander from pool to pool, get a hot waterfall massage or belly up to the wet bar. 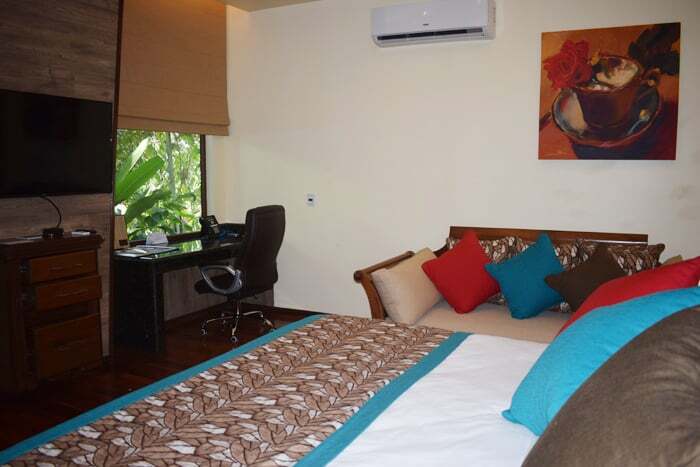 Rooms include the standard Orchid (376 sq. ft.), the Rainforest (367 sq. 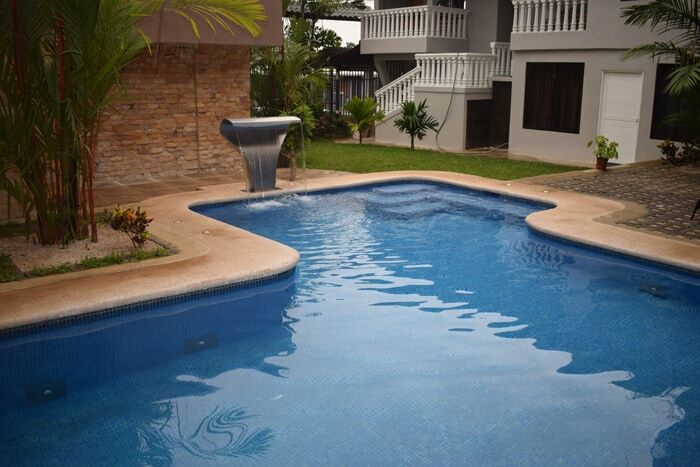 ft., with private balcony and in-room Jacuzzi), the Tabacón suite (1,076 sq. ft.), the Honeymoon suite (1,560 sq. ft, with volcano views), and the Senators suite (2,2530 sq. ft., with two bedrooms). Rates range from $290 to $390 plus tax for the Orchid, depending on season, to $680 to $855 plus tax for the Senators suite. All rates include breakfast and admission to the hot springs, including the guests-only, adults-only Shangri-La Gardens. 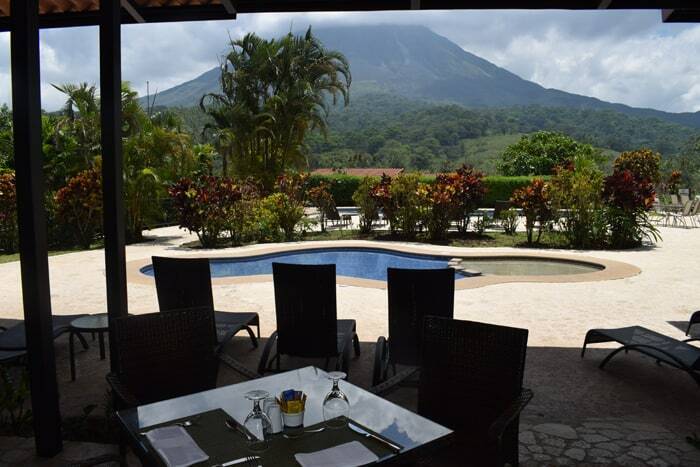 The Springs is the cat’s meow of luxury lodging in Arenal, a nearly perfect resort with all the bells and whistles and more. As we drove up, we thought this place might be different when we saw a helicopter parked on its private helipad, and later saw it taking off, ferrying guests who were too busy to take a car. 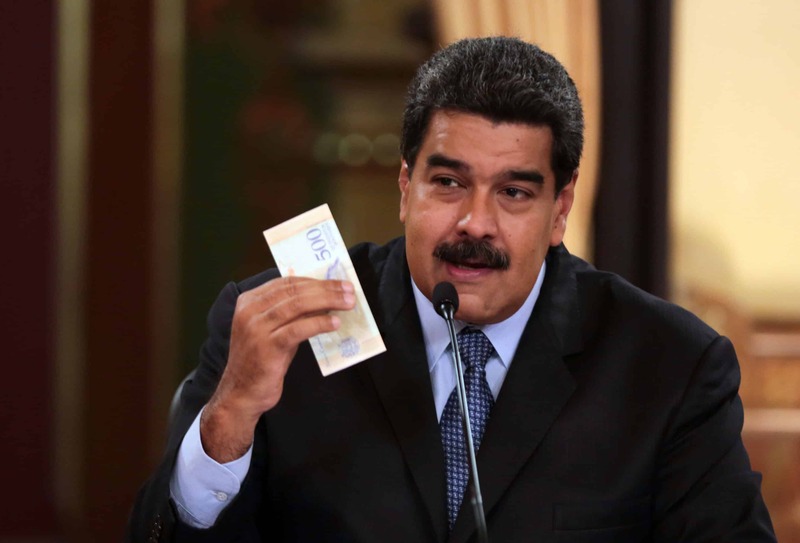 Then we found out the Kardashian family recently visited with an entourage of 70 people, a vacation that will be featured soon on their reality show. We stayed in one of the “standard” Toucan rooms, which start at around $540 a night, and the bathroom alone was like a four-room spa, with his and hers sinks, a Jacuzzi, a shower and a throne. The bathroom mirror alone was approximately the size of a Mini Cooper. 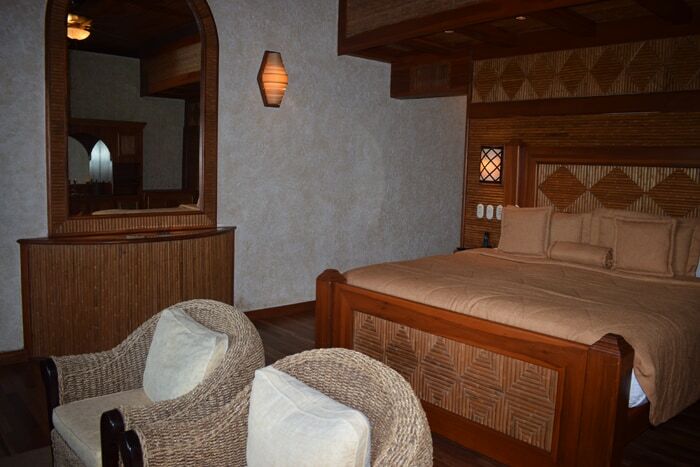 In the bedroom, the king-size bed was surrounded by beautiful teak and bamboo walls and ceilings. And there was a packed minibar, with a selection of liquor including a $45 pint of Chivas Regal. 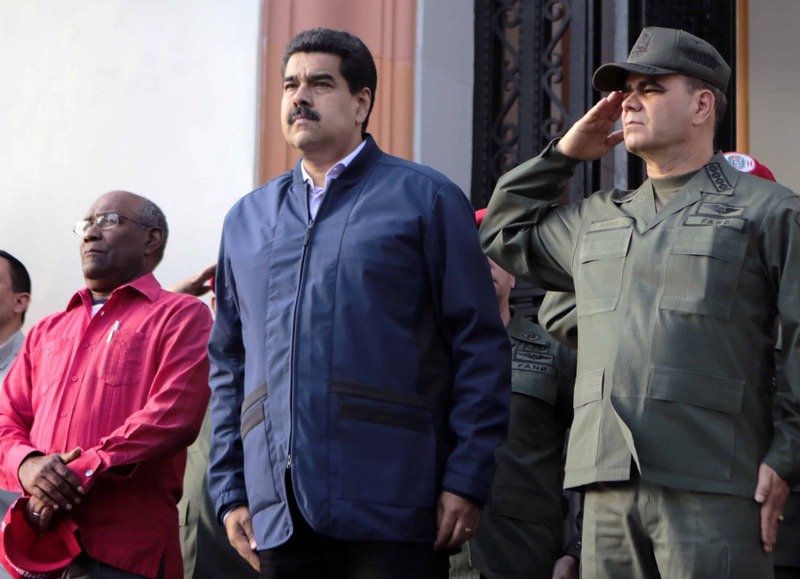 But we spent much of our time at the pool bar, sitting in warm water on barstools shooting the breeze with the four bartenders in matching shirts, who said Will Smith, Kobe Bryant and Sharon Stone stayed here too. 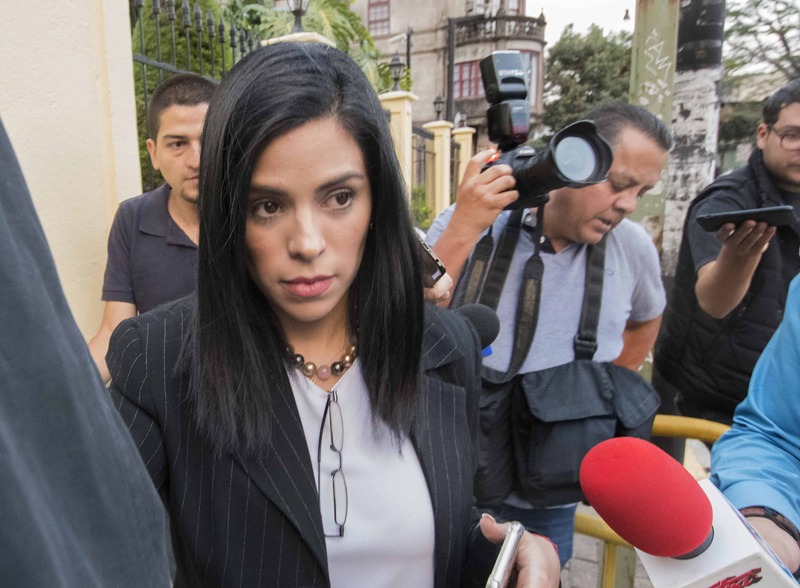 I asked Guiselle why so many chiliguaros kept appearing on the bar, and she said she didn’t order them: the bartenders were just giving them away. My kind of bar. In addition to the 28 hot springs, further downhill at Club Río there’s an animal sanctuary with pumas, ocelots, kinkajous, marmosets and more. And there’s tubing, kayaking, a climbing and rappellng wall, horseback riding, mountain biking and hiking trails. All of the five restaurants and bars here are open to the public, as are the hot springs, at $60 for a two-day pass. 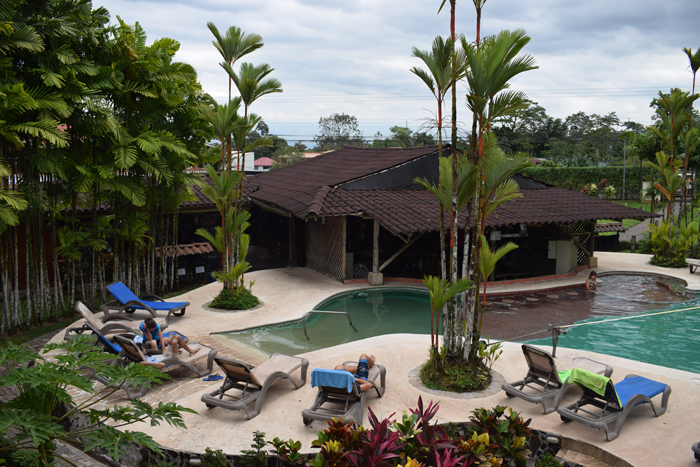 The hotel was built by Lee Banks, a U.S. citizen who also owns the famous La Paz Waterfall Gardens and Peace Lodge in Alajuela. He is a single owner from a family of hoteliers in Florida, and he is often described as a visionary. He designed this hotel himself, his manager told me, with a team of architects and engineers to fine-tune the details. 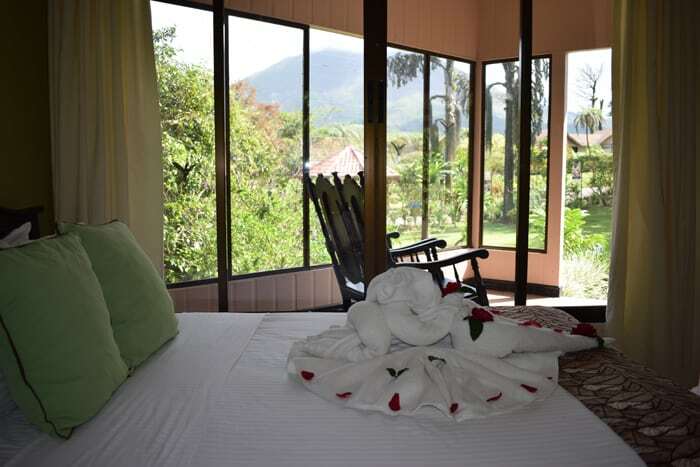 And the idea is brilliant: Every room, without exception, has a splended view of Arenal Volcano (weather permitting). 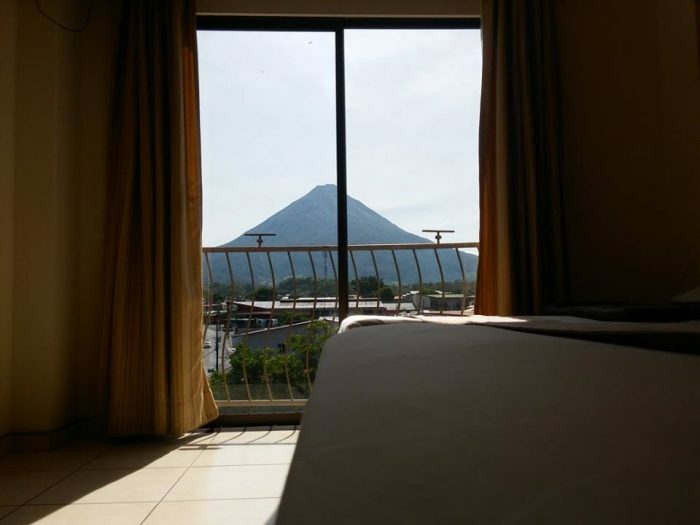 John Picart, the Puerto Rican manager of operations, showed us to our room and said some people think they have to get a room on the third floor, not the second or first, but the fact is the view of the volcano is almost exactly the same from every floor. For dinner, with live music, I was happy to see a couple of pieces of red snapper nigiri on the menu for $5, and that’s what I ordered. Guiselle doesn’t like sushi but she ordered a mess of shrimp, a lo tico, and between the two of us we devoured it all. Then it was time to head back to our sumptuous room. Fancy a Jacuzzi dip? A beer on the patio? A TV movie? This was the last place we stayed in Arenal, and it was the perfect sendoff. Our junior suite had a private stone hot tub in our back yard fed by a natural hot spring (actually, very hot). And the room was a masterpiece, from the carved-wood light sconces over the beds to the latticework on the impressive bar to the perfect bathroom. Around our hot tub, lawn chairs and outdoor table was a thick hedge of pretty plants — you could see through them in places, but this hedge essentially served as a wall, giving us the privacy of our own little yard. “Discretion,” said Guiselle, naming the thing that impressed her most here. She wasn’t worried about anyone seeing her or wondering what she was up to. There were no watchmen strolling around shining flashlights at night, and the place was so spread out that even though it was pretty full, we rarely saw other guests. One of the most beautiful parts of our room was the solid wood, dark gold ceiling, with a strong but silent ceiling fan. The beds were also elegant and comfortable, and there was a table and chairs, a big TV, A/C, a mini-fridge, a coffeemaker and a hair dryer. Unlike some rooms you walk into where it’s immediately obvious that someone forgot to put some art of the wall, nothing has been forgotten here — right down to the elegantly mounted telephone in the bathroom, which I assume is primarily there for emergencies. The restaurant, Surá, served us a first-class filet mignon and an outstanding pinot noir from Chile, along with a good soup and a caprese salad. This was topped off by, of all things, a banana split. 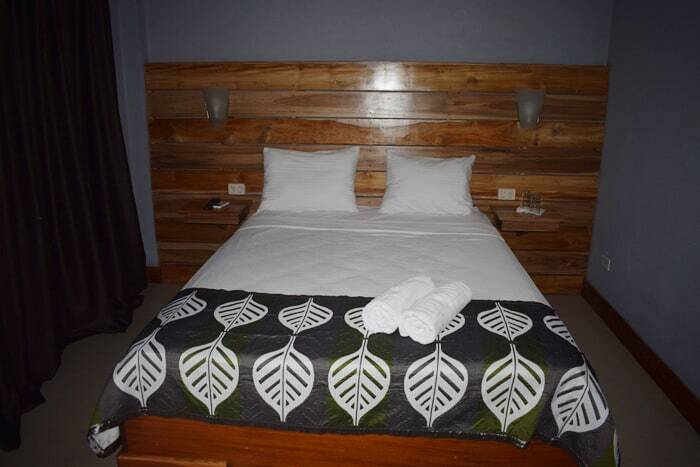 In addition to its 64 rooms, Volcano Lodge has a a hot pool with a swim-up bar and a cold pool with a view of the volcano and a backdrop of a manmade waterfall. It always seemed to be surrounded by chill, blissed-out people, nobody grumpy or unhappy — one mark, I thought, of a good hotel. The three types of rooms here are known as Superior, Superior Termal and Junior Suite, and they cost $225, $325 & $385 respectively, double occupancy, with taxes and breakfast included. Not everyone can afford those rates, but if you’re able to splurge, this may be the perfect place to do it. Michael Krumholtz contributed to this report.